Ethan Allen Furniture Company was named after the Revolutionary War hero, Ethan Allen. Ethan Allen (the person, not the company) played a very important part in getting Vermont admitted as 14th US State. Ethan Allen (the company, not the person) has adopted the same pioneering spirit as its mascot. 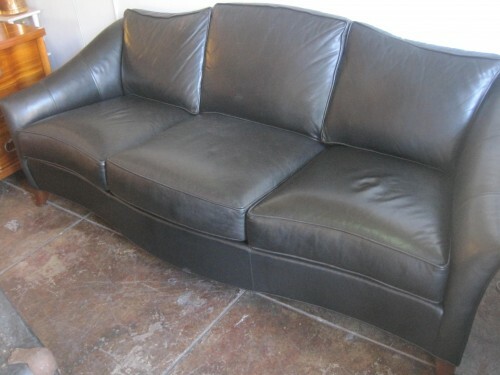 This Ethan Allen leather sofa has an arched back and curved front. It was made with the highest quality full grain cowhide and is in excellent condition.